The late George Elliott started out with a love of fast Fords and wound up building a racing dynasty. Between his success as a car owner and that of his sons and grandsons as drivers and mechanics, the Elliotts have established themselves as the first family of Georgia racing. Elliott, a Dawsonville native, began fielding race cars for north Georgia short trackers like Dan Lingerfelt and Aaron Gailey and eventually moved to the elite NASCAR circuit now known as Sprint Cup in 1966 with Don Tilley driving his Ford at North Carolina Motor Speedway in Rockingham. 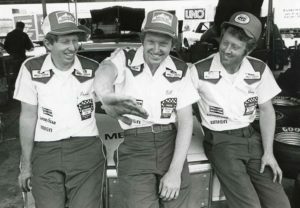 Other drivers to wheel Elliott’s Fords included Georgia Racing Hall of Fame members Jody Ridley and Charles Barrett, but the greatest days came with his oldest son Ernie working as crew chief alongside middle son Dan, and Bill, the youngest, doing the driving. From a humble start at Rockingham in 1976, the team and its No. 9 Fords soon became one of the powerhouses of the Cup series. In his 37-year career, Bill Elliott won 44 races, 55 poles, the 1988 championship and the first Winston Million. He has been voted into the Georgia Racing Hall of Fame along with his father and brother Ernie as well as the NASCAR Hall of Fame. The Elliott legacy is three generations deep as Ernie Elliott’s late son Casey was a short track standout, winning major races including the Budweiser 300 at Lanier Raceway in 1993 while also competing in the NASCAR’s Busch Series. Casey Elliott’s promising career was cut short by cancer, and he died in 1996. Today the Elliott family’s reputation is again being showcased, this time by Bill Elliott’s son Chase, who won nearly every major short track race in America, including the Winchester 400 and the Snowball Derby before embarking on a NASCAR career that has seen him win a Camping World Truck Series race in his sixth career start, in 2013 at age 17. In 2014, his rookie season in the Nationwide Series, he had multiple wins, including his first in his sixth start in the series, and is destined to follow his father’s tire tracks to NASCAR’s elite Cup circuit.